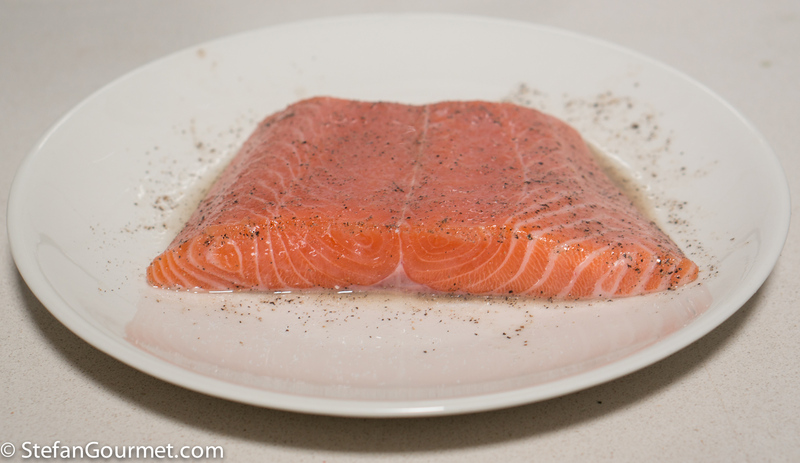 Season the salmon fillet with salt and freshly ground black pepper, and sprinkle with freshly squeezed lemon juice. Allow the salt to penetrate the fish while you prepare the peas. 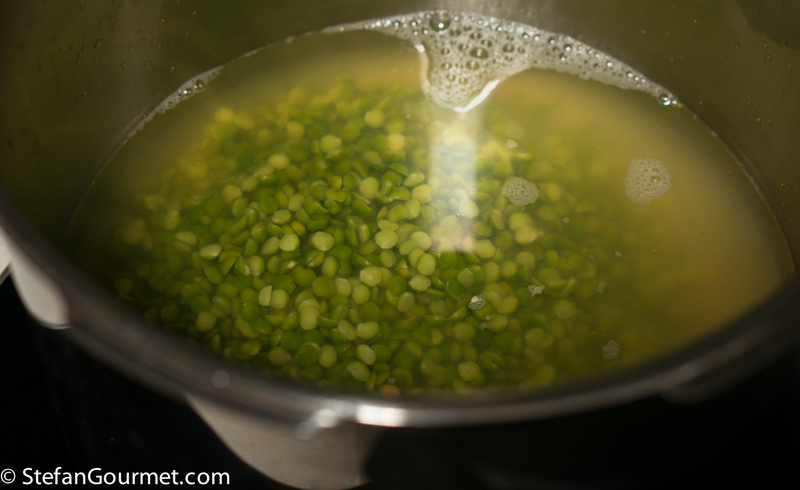 Rinse the split peas with water and drain. 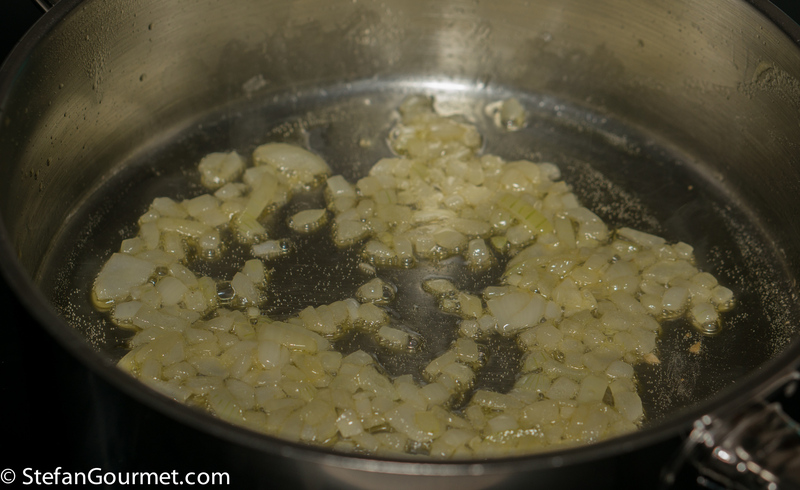 Put them in a pressure cooker or stock pot with the vegetable stock. Pressure cook for 30 minutes or boil for 1 hour. The peas are ready when they fall apart. 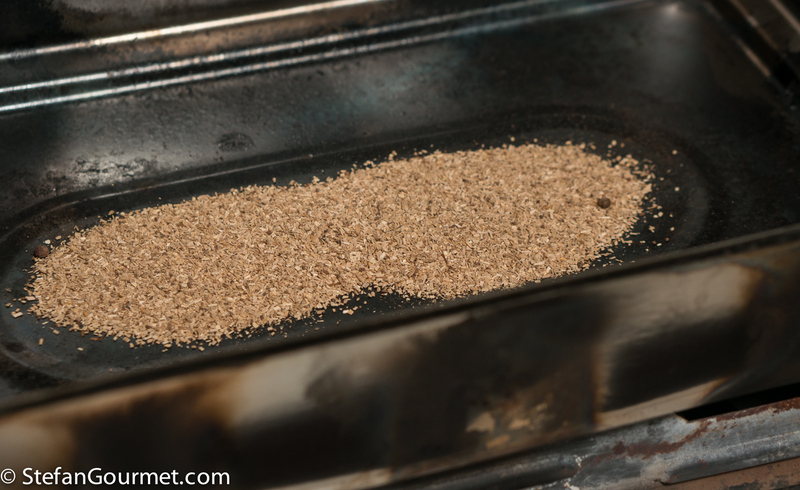 Meanwhile, prepare a tabletop smoker with 2 tablespoons of smoking dust. 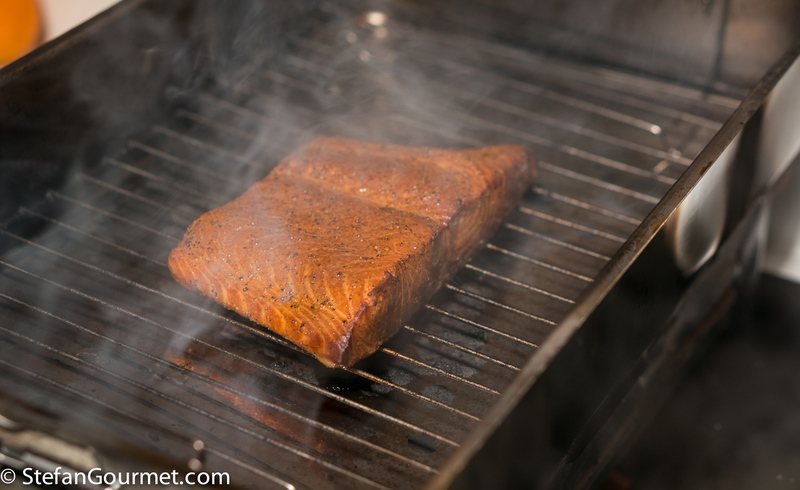 Put the salmon in the smoker, so everything is ready to light the smoker later. 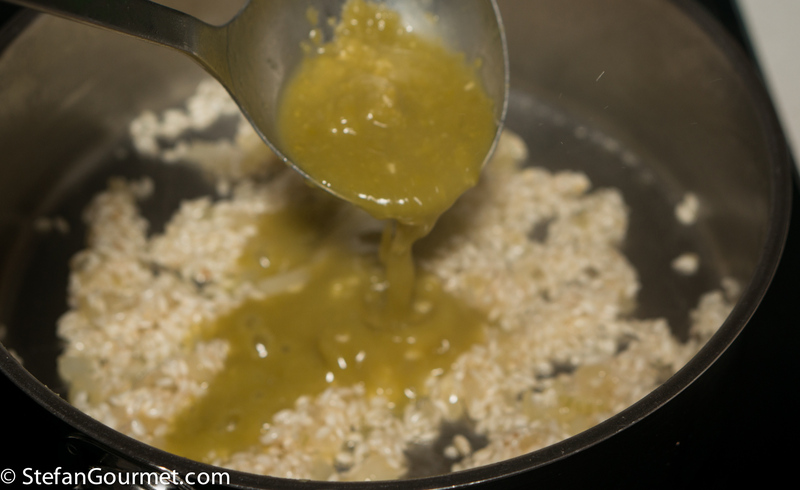 Sauté the minced onion in 2 tablespoons of the butter over medium heat in a wide thick bottomed pan until translucent. 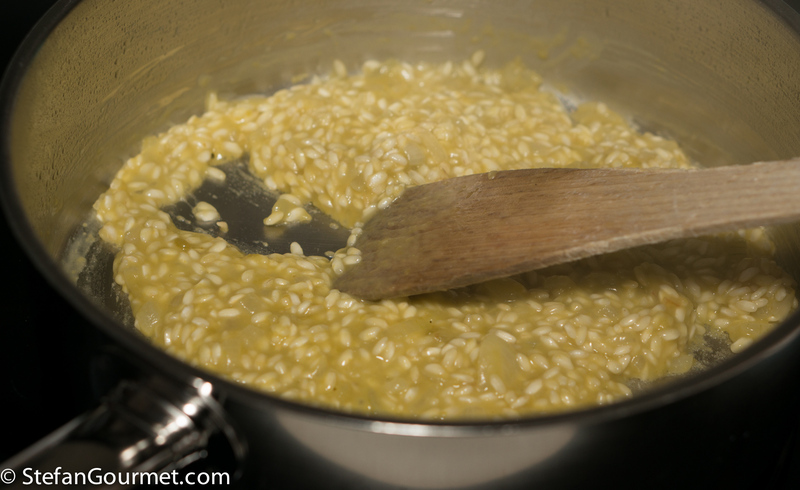 Add the rice and toast the rice over medium heat until the rice is hot. 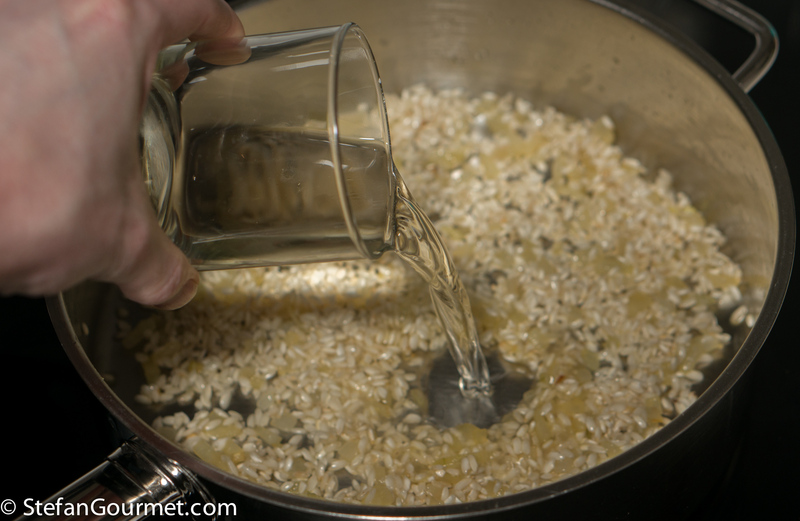 Add the white wine, and stir until the wine has evaporated. 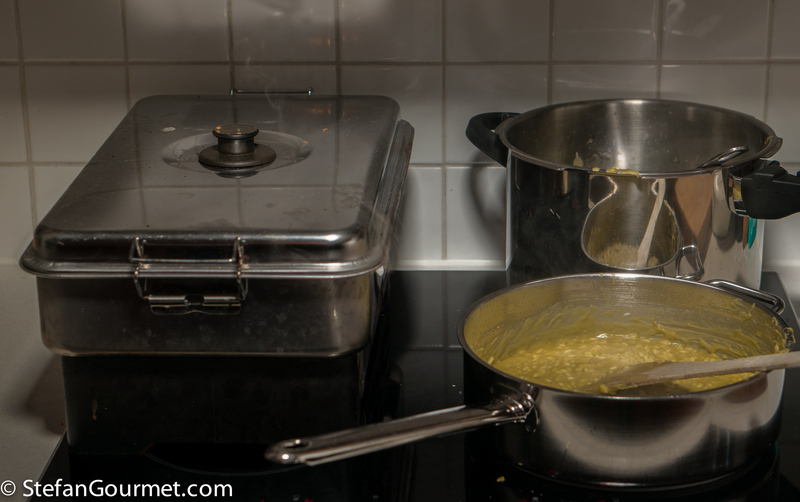 Now add a ladle of the pea and stock mixture. Season with salt. 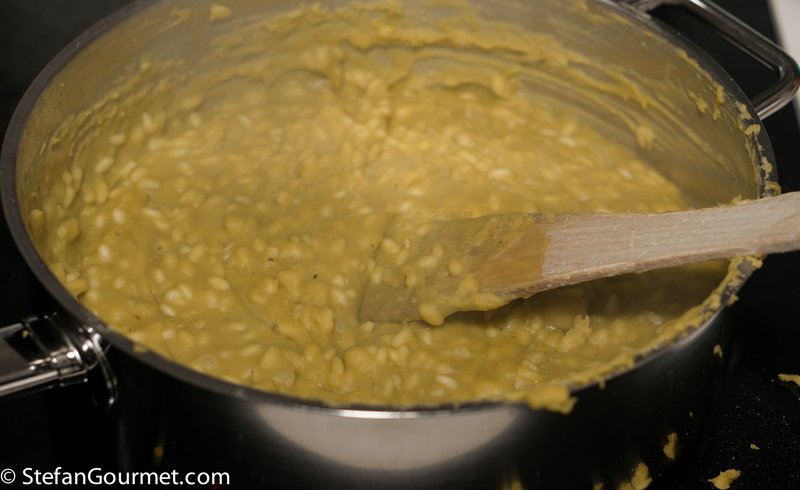 Stir until the liquid has been absorbed, then add another ladle of the pea mixture. Keep stirring and adding more of the pea mixture until you have used up all of the mixture and the rice is tender but firm to the bite, about 18 minutes. Light the smoker. 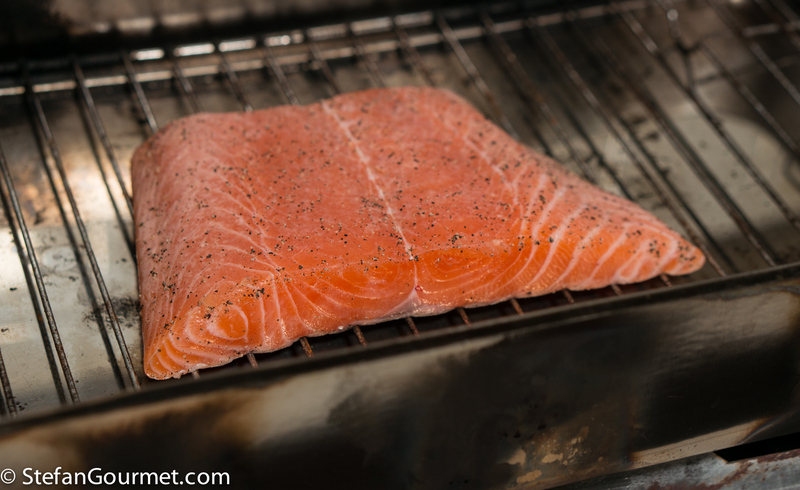 The salmon needs to be smoked for about 15 minutes or until it is just cooked through. Do not overcook the salmon, as that would make it dry. 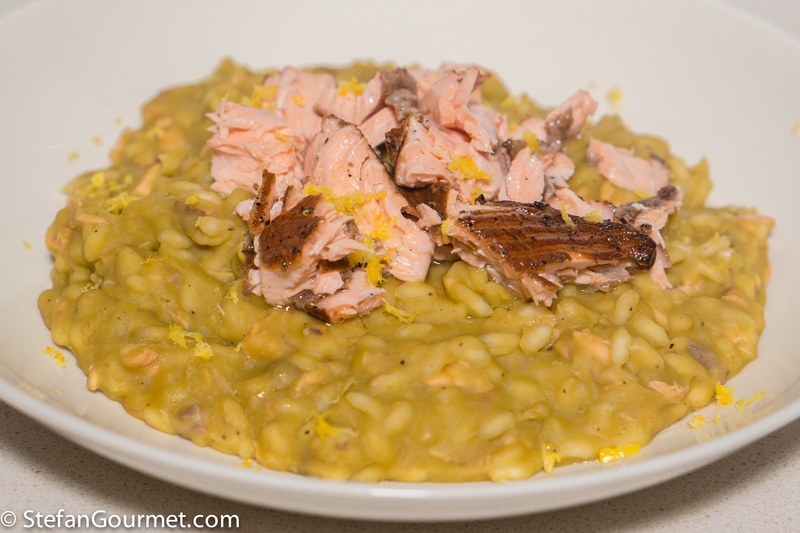 If you time everything right, the risotto and the salmon are ready at about the same time. 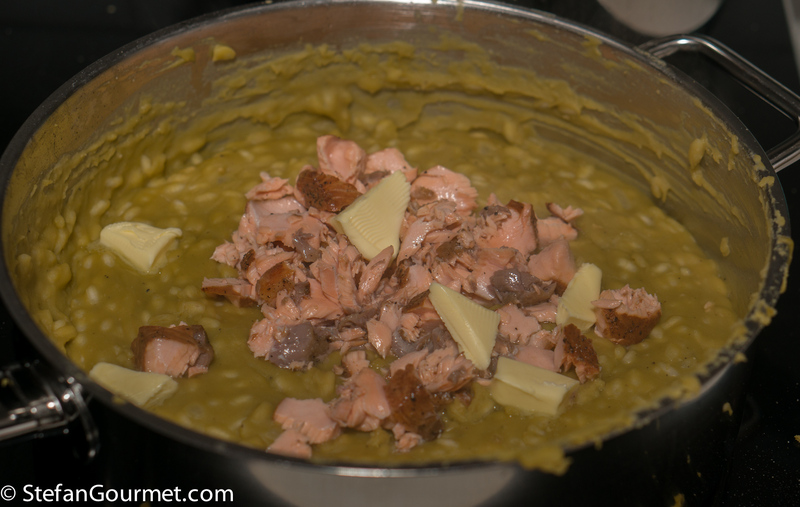 Flake the salmon and add about half of it to the risotto, together with the remaining tablespoon of butter. Stir to incorporate, then taste and adjust the seasoning with salt and freshly ground black pepper. 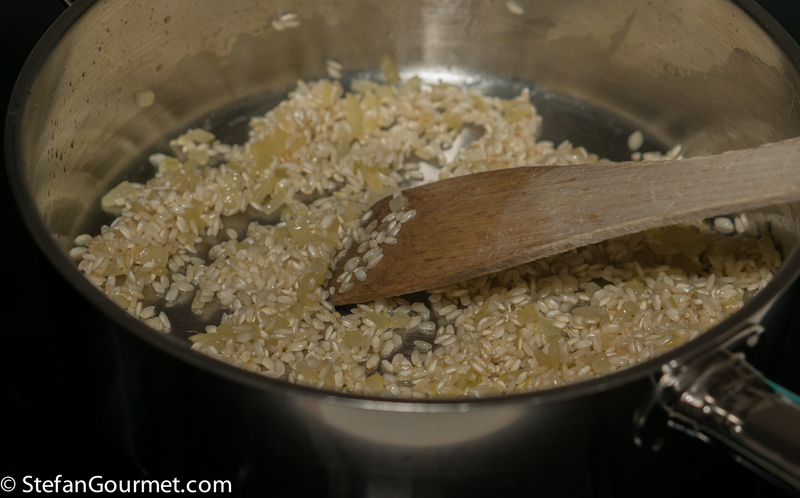 Serve the risotto on preheated plates with the remaining salmon on top, and garnish with grated lemon zest. We enjoyed this with a Friulano from Friuli that was made using used wooden barrels. The used wood doesn’t give off any flavor, but it does make the wine more round and creamy and that works well with this dish. 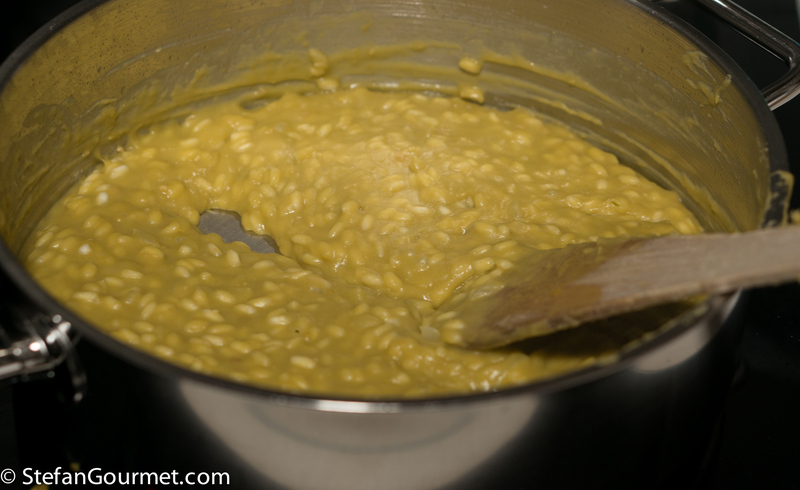 Interesting idea using the pea soup as a risotto medium. I bet red lentils might do a nice job too. Yes, but I would pair lentils with smoked meat. Please keep on using your imagination as I find this recipe both original and appetizing even tho I can get fresh vegetables all the year round. The use of salmon is inspired also. That said and reading Sybaritica’s comment re red lentils in a similar dish I do realize that in making mid-Eastern mujadarrah quite regularly I already do use red lentils and rice together and enjoy it greatly. Yes, it would so work here !! Some of my best soups come out of my head! (But not always, sometimes it just doesn’t work out.) 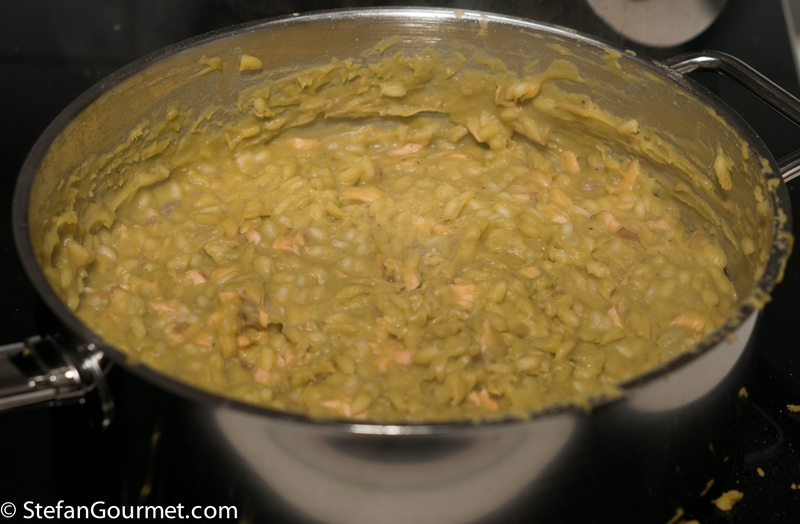 The smoked salmon is an interesting pairing with peas, but I can see how it would work with the smoky flavor that is usually added with pork. This is so interesting! I like that you puréed the cooked split peas; I thought you might mix the two. No difference than adding puréed squash, except you get the health benefits of legumes. And with the hot-smoked salmon – brilliant!